Clarksville, TN – The 5th Annual Austin Peay Women’s Football Clinic will be held on July 28th from 9:00am to 2:30pm on at Austin Peay’s football offices and in Governors Stadium. The football clinic features informative presentations by the coaching staff as well-as an entertaining hands-on demonstration of some fun football drills, explanation of the rules by an OVC Official, a commemorative t-shirt, raffles and a delicious lunch. Ladies are you ready for some football! 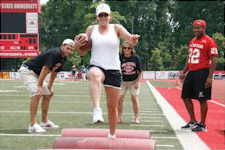 The 3rd Annual Austin Peay Women’s Football Clinic is being held this Saturday, July 24th from 9:00am – 2:30pm. The clinic features informative presentations by the coaching staff as well as an entertaining hands on demonstration of some fun football drills.